Copyright (C) 2010, Jon Armstrong. I woke early, suffocated by a sweaty and prickling sense of apprehension — exactly the feeling of wool against the skin on a warm day. Yet there, in the dark of my bedroom, the sun seemed impossibly far away. What had set this fear in my veins? None of my current design projects were so difficult or important. I was using a new half-micron twill for a suit, but I had tested the fabric extensively and knew its properties. And though the motor-driven ball gown we were creating was complicated, my assistant and I had spent a whole day installing the mechanics and testing it again and again. No, those projects were essentially complete, and I felt good about their look, materials, and function. It was no use. Neither sleep nor an answer was forthcoming. I rose, wrapped in swirling unease, and prepared for the day. It was still dark as I drove through the obsidian and gold towers of Ros Begas to the studio. And as I walked the two hundred meter metal and wood meditation and exhibition entry hallway that spiraled in from the building entrance to my showroom front door, I went over the fashion consultations I had scheduled for the day, the calls I needed to make to suppliers, the fabric tests I needed to run, and the gathering swarm of details for an upcoming show. In the hallway, I powered-on the fashion exhibits that I had on display: including two fabric bursting automatons and a pilling analysis machine, and stooped to collect a few dust fibers on the dark wood floor. At the end of the spiral, I paused at a display that held the yarn I had gotten from my father. It rested on black velvet and was lit with a single hetrojunction crystal, which bathed the thread with a warm, otherworldly glow, recalling the dawn when I’d pulled this strand from my father’s pocket so many years ago. But my memories could no linger because someone or something was lurking beyond the next curve, near the showroom doors. 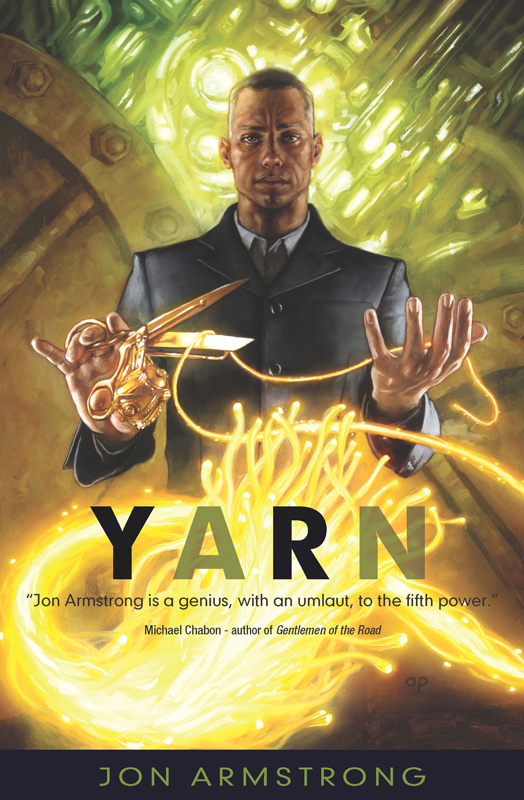 Purchase Yarn at Amazon or Barnes and Nobel.